When the Art Fair is imminent, the energy is in the air. Every gallerist in town saves space for a heavy-hitter show. And once the out-of-towners leave, the electricity remains, at least in the form of a young gun’s next chapter and the debut of a new Oak Cliff space with an open-door artistic policy. So pace yourselves, because three must-see exhibitions, a pop-up party, and a new debut are just the thing to inspire a month when the eye truly has to travel. However you view America’s past, we are all immigrants, a fact recognized by British artist Sarah Ball’s intimate paintings. Drawn from a series of historically archived mug shots, freedom riders, homosexuals, and anarchists are portrayed as innocuously as a driver’s license photo, with their histories hidden by their somewhat blank visages. Joining her is the latest installation of newly anointed art world superstar Gabriel Dawe, whose most ambitious local piece is a rainbow bridge across the atrium of the Amon Carter Museum of American Art in Fort Worth. Having spotted his potential from the beginning, Conduit gallerist Nancy Whitenack says that unveiling his latest “silver lining” piece is merely another step in the artist’s brilliant career. Since Galerie Frank Elbaz exploded on the scene last fall, there’s been a distinctly European sensibility added to the local scene, and a welcome one, at that. This may be why the Paul Galvez-curated “Paris Texas” show seems so perfect for this particular place and time. Not only is it a charming look at the universal fascination for the wide open spaces exemplified by the endless Texas landscape, it’s also a glimpse at the open road as envisioned by superstar American artists Ed Ruscha and Robert Rauschenberg, along with Belgian Francis Alÿs, New York-based Blair Thurman, French-born Davide Balula, and Londoner Julie Cook. Galvez says he was inspired to curate the show by two things: the I-635/Hwy. 75 underpass and the queries of his Parisian friends as to what being in the American West was really like. “I found myself inevitably resorting to the same images — highways, flat horizontal landscapes, cars, a city without one dominant central area,” he explains. “So, after some research around the words ‘Paris Texas,’ I stumbled across not only the city Paris, Texas, but also the film by Wim Wenders, a director about whom I had always wanted to learn more. After watching the movie, I thought it (and the art in dialogue with it) was a perfect way to combine my own professional interests with that of Galerie Frank Elbaz, yet another manifestation of Paris/Texas." What are the words for when no one listens anymore? Not texting, or arguing, or even seduction. In the world of sculptor Simeen Farhat, currently unveiling her second exhibition at Cris Worley Fine Arts, writing has evolved into the earliest form of communication — gestures, at least in 3-D form. 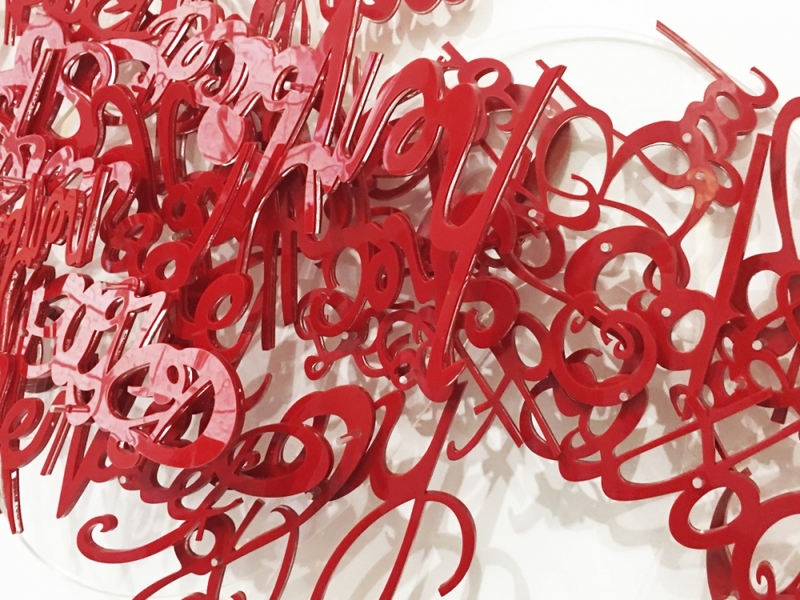 Her loop-de-loop resin and acrylic wall reliefs don’t just offer an example of perfect penmanship, they serve as a poetic meditation on the dual nature of life’s most vital element: blood. Hot or cold, love or hate, the dichotomy of this Pakistan-born artist’s current subject is clear in her remote yet visceral pieces based on the precious fluid that runs through our veins, reinterpreted as a large-scale drop of pure red plastic. Farhat says her inspiration for three-dimensional language began in 2014 with a work based on Alice's Adventures in Wonderland. Alice’s tears morphed into a representation of human emotion suspended in space, while a piece called Expulsion depicted a woman vomiting words from her mouth. Choose what you say carefully. “Life in Black and White,” Cameron Smith at Bishop Arts Modern, 518 W. Davis St.
A Renaissance man in a modern world, Cameron Smith has been a jazz musician, radio personality, advertising executive, talent booker, and fine artist. He decided to pour his energies fully into the latter with the opening of Bishop Arts Modern this month. Having owned the space for nine years as a private studio, Smith wanted to exhibit his own work, but also give an outlet to other local talents who create outside the typical gallery system. Smith will balance half the year of his programming with outside works, half with his own, launching the first in a series of four shows with Franz Kline-inspired black and white paintings. Way, way back in 2015, it felt like the city was the Wild West as far as pop-up spaces and punk-rock curatorial ethos were concerned. Fast forward to today, and the energy that drove such venues as Ware:Wolf:Haus and Vice Palace have been contained a bit, but their founder, Art Peña, isn’t reigning in his own creative juices any time soon. Next up in his series of single evening events Peña is producing is the first edition of "ONO: One Night Only," featuring the work of LA-based artist Jay Stuckey in the former RE:Gallery (now a private residential arts incubator) in The Cedars.